August 4, 2013—While listening to NPR this morning I heard a statement on Global Warming, “If we wait 80 years to deal with global warming, it may take 20,000 years to get our planet back to a livable condition. If we deal with it now, we could remain a planet that is habitable.” Eliminating the burning of fossil fuels is the key to reducing greenhouse gases. Coal is the earth’s number one fossil fuel offender. It’s the main greenhouse gas which traps heat in our atmosphere. Also, a method used in the Appalachian Mountains, mountaintop removal to extract the coal, has created a nearly irreversible devastation to this part of our planet. Approximately 10% of our nation’s coal comes from Appalachia, where mountaintop mining is destroying thousands of acres in one of the oldest mountain chains on the planet–nearly 480 million years old! 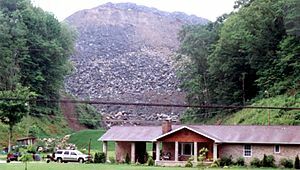 Mountaintop mining has been taking place since the 1960’s, destroying more than 500 mountaintops by heavy machinery and explosives in Virginia, West Virginia, Kentucky, and Tennessee. This type of surface mining accounts for nearly half of the coal mined in these states. Extracting the coal from the mountaintops of Appalachia leaves the mountain tops demolished and contaminates thousands of acres surrounding the surface mines. Toxic mining products are dumped into nearby valleys and streams in what is called “holler fills,” completely buryed more than two thousand mountain streams! Why use this method of mining? Fewer miners are needed for mountaintop mining because most of the work is completed by explosives and heavy machinery. Also, in the 1990’s, demand for electricity greatly increased, unleashing coal companies to use any method possible to meet the higher demands of our population. When a corporation’s shareholders speak out against the corporation, maybe it’s time for CEO’s to quit burying their heads in the sand and look at their policies of “business as usual”—at any cost to life and land! Categories: Energy Programs | Tags: Appalachia, Appalachian mountains, Coal mining, Dominion Resources, Global Warming, Mountaintop Mining | Permalink. Thanks, Duncan, for your firsthand information on mountaintop mining. I write these articles with positive hope that there are people out there who care and that “knowledge is power”—to make the changes we need to move away from fossil fuels.